Paul wrote this letter about 56 A. D. when he was in the city of Corinth, before his trip to Jerusalem. Written to a church he hoped to visit soon. Paul had not yet visited the church in Rome. 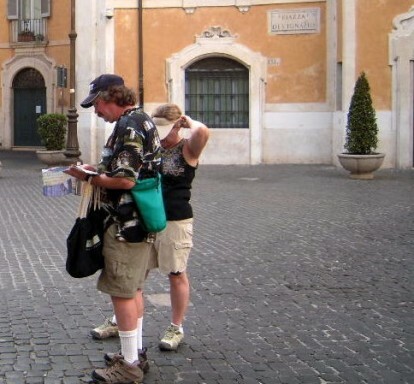 He wanted to go there and he prayed that God would make this visit possible (Rom. 1:10-12; 15:23-24). This makes the letter to the Romans unique. Most of Paul’s other letters were written to churches where he had personally ministered. But here was a church (the church at Rome) where Paul had not been and where Paul had not taught. So the Book of Romans was preparation for when Paul would arrive in Rome. Here in the book of Romans Paul gives a doctrinal preview of the content of his teaching ministry. What Paul unfolds in these 16 chapters is nothing less than a doctrinal masterpiece. What are the central truths of Christianity? What is the gospel really? What formed the foundation of Apostle Paul’s preaching wherever he went? To find the answer to all these questions we turn to the greatest doctrinal book in the New Testament — the epistle of Paul to the Romans. A group of scholars once made a list of the fifteen greatest books, books that were great based upon their beneficial influence upon humanity. Included in this list were John Wesley’sJournal, Luther’s 95 Theses, Augustine’s City of God and John Bunyan‘s Pilgrim’s Progress. As his Journal reveals, Wesley was an unsaved preacher until he read the book of Romans and understood God’s way of salvation. 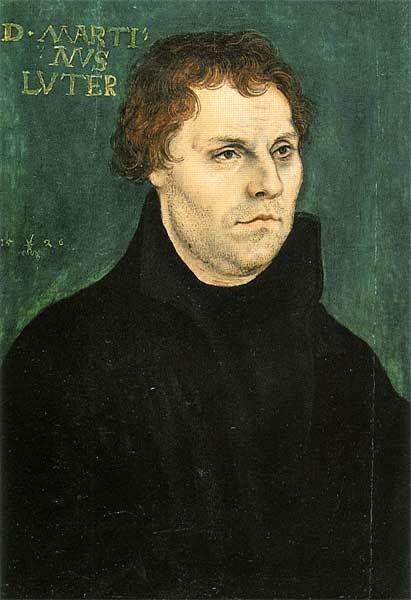 Luther, a Catholic monk, was greatly influenced by Romans 1:17, “The just shall live by faith,” which opened his eyes to the truth of justification by faith. Augustine’s City of God was founded on his study of the Book of Romans. Bunyan’s Pilgrim’s Progress was written after reading the Book of Romans in prison. It became the best selling book of all time, next to the Bible. Among the greatest books of the world, four which come near the top of the list were all directly influenced by the Book of Romans. Has the Book of Romans changed your life? When was the last time you read through Romans? Although Paul knows many of the people to whom he is writing, he did not found the church, and he has never been to Rome. So he has some work to do in the first 17 verses to introduce himself and his agenda. The “gospel” ties together Romans 1:1-17, and, indeed, the entire letter. In the introduction, Paul features both the content and the power of the gospel that unites Jewish and Gentile believers in Rome. The object of the apostle in writing to this church was to explain to them the great doctrines of the gospel. His epistle was a “word in season.” Himself deeply impressed with a sense of the value of the doctrines of salvation, he opens up in a clear and connected form the whole system of the gospel in its relation both to Jew and Gentile. The following terms must be understood if we are to understand the personality of Romans. Paul’s approach to these terms are nothing short of foundational to understanding the true Gospel of Jesus Christ. I am certain that most of us do not understand these terms the way Paul wants us to. The Law is not to be understood in terms of “Thou shall and thou shall not’s“. We commonly think that laws are obeyed and satisfied by works, whether your heart is in it or not. But God’s Law makes its demands not on your works but on the depths of your heart and does not let the heart rest content in works. God calls all of us liars in Ps 116:11, because none of us keep the law from the depths of our heart. We all have an aversion to good and a craving for that which is forbidden. If our heart does not freely desire righteousness, our heart has not set itself on God’s Law. Regardless of outward good works, the appearance of an honorable life, our heart is sinful and deserving of the wrath of Righteous Holy God. You keep the Law (selfish motivations) outwardly out of fear of punishment or love of reward. You do everything as though you are chained-without free desire and love of the Law. If the Law did not exist you would be relieved, you would rejoice. In fact, Paul says (in Romans 5) that the Law causes sin to increase. This is because a person becomes more and more and enemy of the Law the more it demands of him what he can’t possibly do. 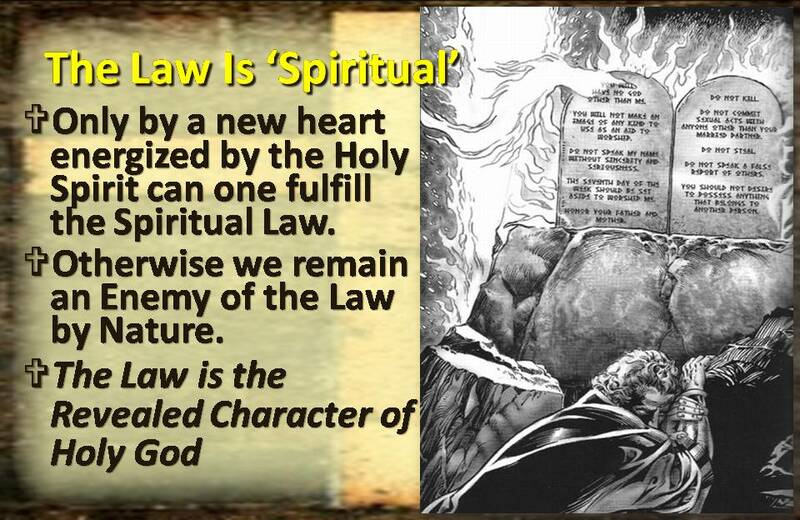 In Romans Seven, Paul says the Law is “spiritual”. What he means is that it were physical, it could be satisfied by your works. 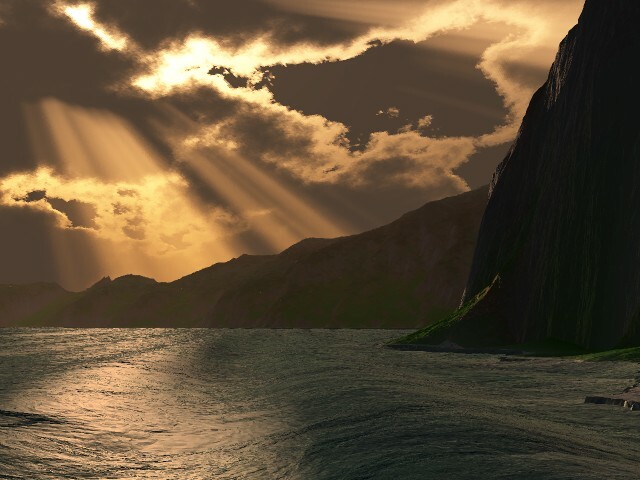 Since it is spiritual, no one can satisfy the law unless everything you do springs from the depths of your heart. But no one can have such a heart except the Spirit of God, who gives us a New Heart which has a heartfelt longing for the law and does everything not through fear or coercion, but from a new free and willing heart! Only by a new heart energized by the Holy Spirit can one fulfill the Spiritual Law. Otherwise we remain an enemy of the Law by nature. You must get used to the idea that it is one thing to do the works of the law and quite another to fulfill it. The works of the law are everything that a person does or can do of his own free will and by his own powers to obey the law. But because in doing such works the heart abhors the law and yet is forced to obey it, the works are a total loss and are completely useless. To fulfill the Law means to actively obey and do its work lovingly and freely, as if there was no Law. The Law is the expression of the character of God. 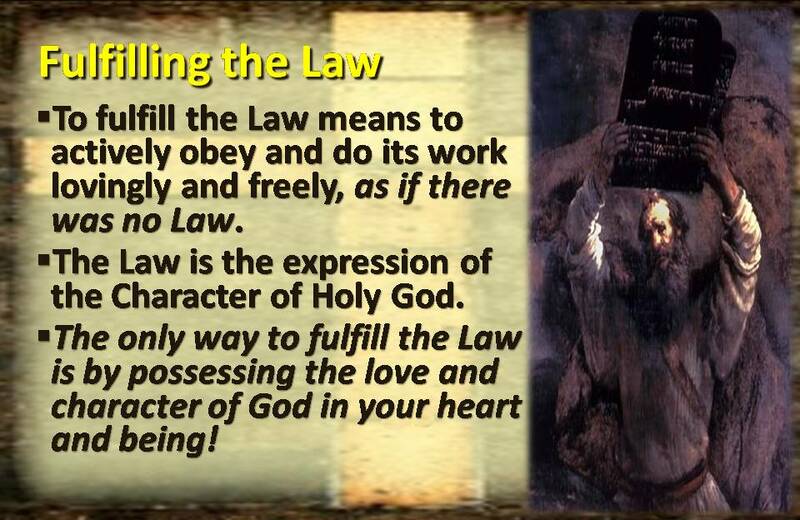 The only way to fulfill the Law is through possessing the love and character of God in your heart and being! Faith alone makes the Love and Righteousness of God reality in our hearts. Faith alone fulfills the righteousness of the Law. Good works that proceed from faith alone are the only works that satisfy the demands of the Law. 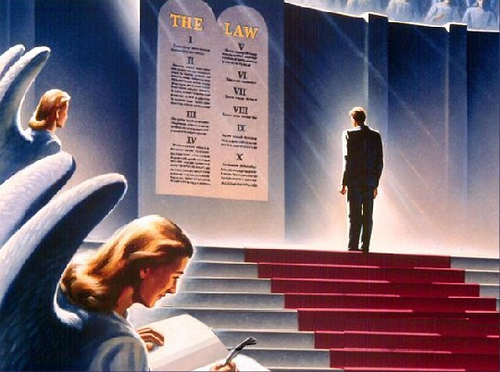 The Law as Paul sees it: The Law is Spiritual – the revealed Character of Holy God. In Romans Paul deals with our sins, and then he deals with our sin. Sins refers to the external works of the body and soul. Sins of omission and commission. Sin refers to those forces within us that move us to do the sins. Sin is from the depth of our wicked heart with all its powers and inclinations. 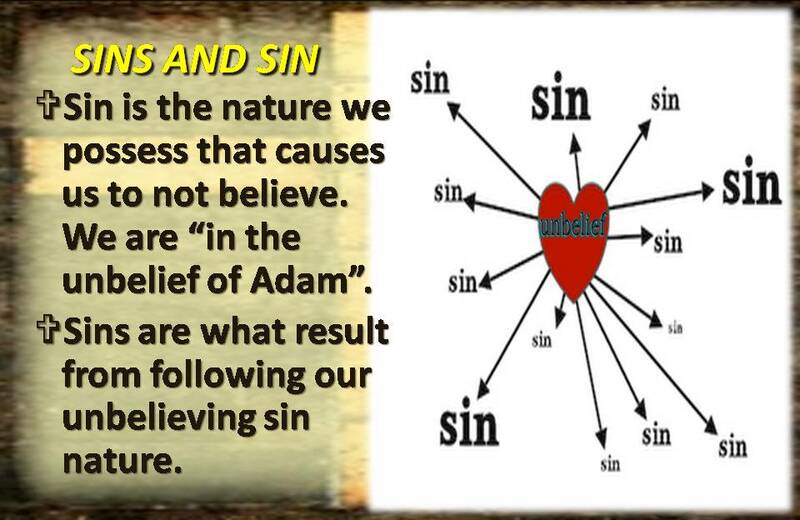 The root and source of our sins is the sin nature that comes with being “in (the unbelief) of Adam”. The Holy Spirit and the Scriptures see into the heart, to the root source of sins, and that is our sin nature, which is founded in unbelief in the depth of the heart. Just as faith alone makes us just and brings the Spirit and the desire to do good external works, so it is only unbelief which sins and exalts the flesh and brings desire to do evil external works. Sin is the nature we possess that causes us to not believe. Sins are what result as a result of our unbelieving sin nature. In Romans, Paul will show us how God can deal with our sins, and also our sin! Grace is the active force in our lives which makes us completely just before God. God’s grace is not divided into bits and pieces, as are the gifts, but grace takes us up completely into God’s favor for the sake of Christ, our intercessor and mediator, so that the gifts may begin their work in us. By this, we understand chapter 7, where Paul portrays himself as still a sinner, while in chapter 8 he says that, because of the incomplete gifts and because of the Spirit, there is nothing damnable in those who are in Christ. Because our flesh has not been killed, we are still sinners, but because we believe in Christ and have the beginnings of the Spirit, God so shows us his favor and mercy, that he neither notices nor judges such sins. God’s grace allows Him to deal with us according to our position in Christ until our flesh is completely redeemed. 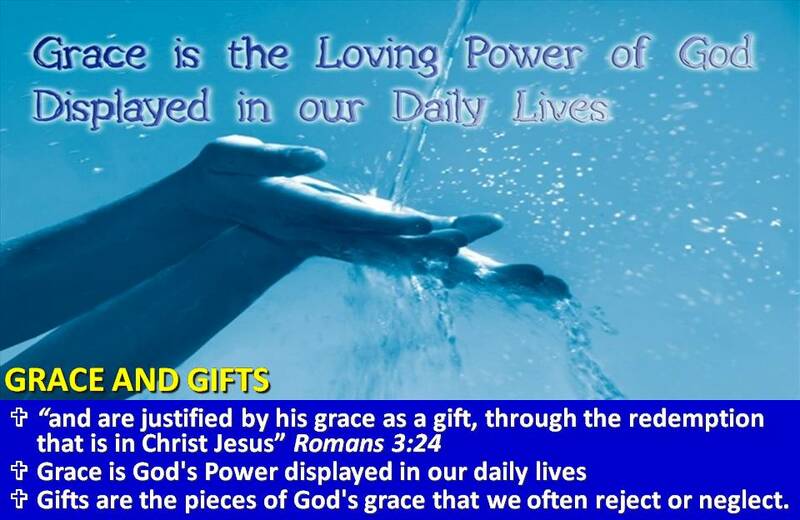 Gifts are the pieces of God’s grace that we often reject or neglect, and can lead us to miss or refuse God’s Grace. Faith is a work of God in us, which changes us and brings us to birth anew from God (cf. John 1). It kills the old Adam, makes us completely different people in heart, mind, senses, and all our powers, and brings the Holy Spirit with it. Faith places us IN CHRIST. Faith keeps us abiding in Christ. We live the exchanged life by THE FAITH of the Son of God, who loved me and gave himself for me. 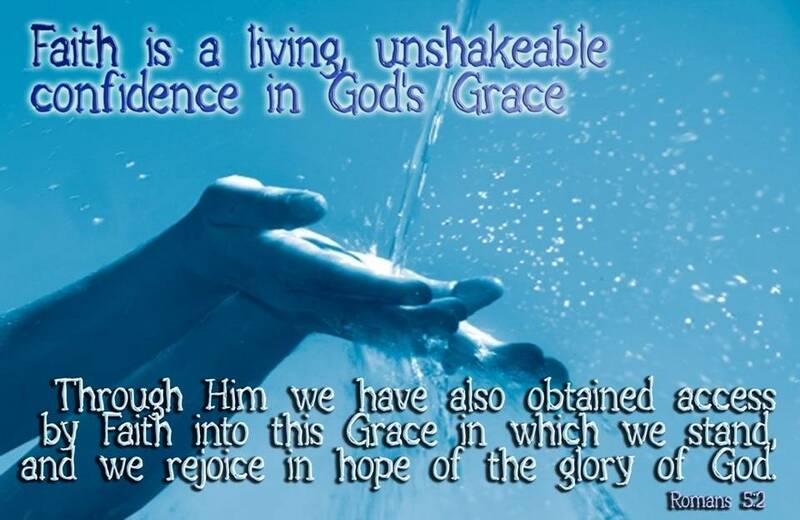 Faith is the living, unshakeable confidence in God’s grace. This kind of trust in and knowledge of God’s grace makes a person joyful, confident, and happy with regard to God and all that He does. Through faith, a person will do good to everyone without coercion, willingly and happily; he will serve everyone, suffer everything for the love and praise of God, who has shown him such grace. It is as impossible to separate works from faith. Through faith a person becomes sinless and eager for God’s commands. Thus he gives God the honor due him and pays him what he owes him. Faith comes only through the word of God, the Gospel, that preaches Christ: how he is both Son of God and man, how he died and rose for our sake. Paul says all this in chapters 3, 4 and 10. That is why faith alone makes someone just and fulfills the law; faith in God’s promises sees the Power of the Holy Spirit in our daily lives. Faith opens our will and want to to do those ‘good works’ which God designed us for. Then good works proceed from faith itself. That is what Paul means in chapter 3 when, after he has thrown out the works of the law, he sounds as though the wants to abolish the law by faith. No, he says, we uphold the law through faith, i.e. we fulfill it through faith. Faith makes the Vitality and Power of God real in our daily living. You must not understand flesh here as denoting only immorality or spirit as denoting only the inner heart. In Romans, Paul not only calls every human being ‘flesh’ but also everthing done by human beings in their own strength or in their own devices “fleshly”. Those living in the flesh can be sinners as well as saints. 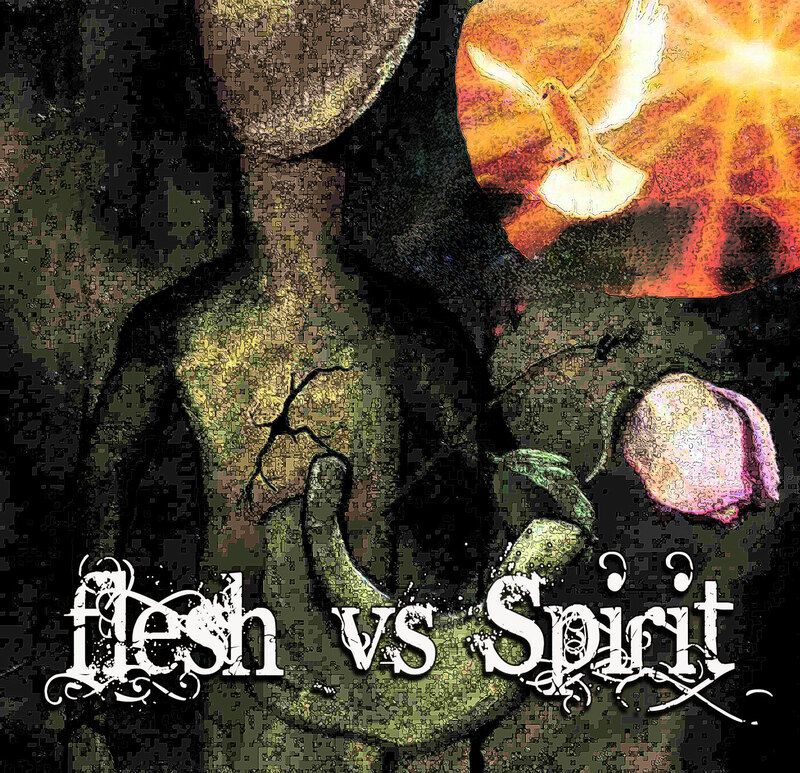 Anything done apart from the Spirit of God is walking in the flesh and not the Spirit. In Romans 8, Paul says that, through the flesh, the law is weakened. He says this, not of the immoral, but of all sins, most of all of unbelief, which is the most spiritual of sins. 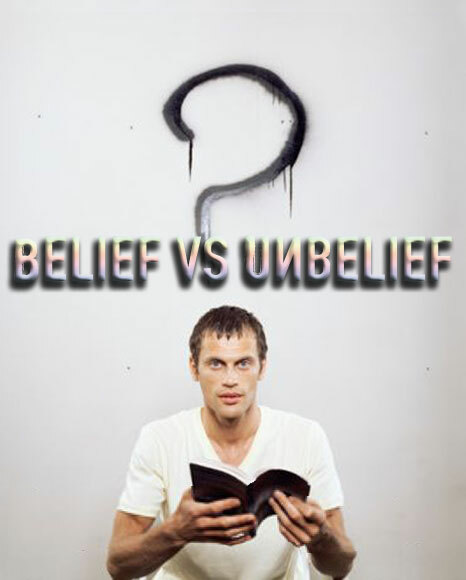 Unbelief destroys the SPIRITUAL life of any believer. A person is spiritual who has been born of the Holy Spirit, and lives in and by the Spirit. Outward righteousness is a result of the inward spirit of God producing the life and character of God. 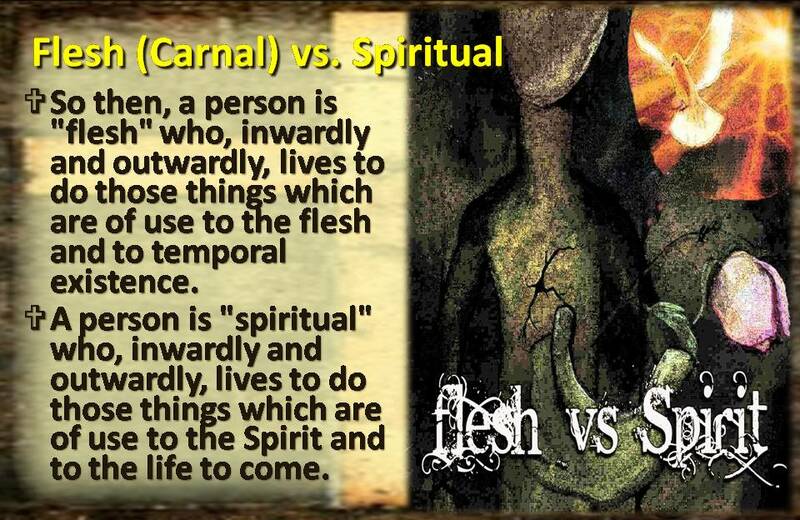 So then, a person is “flesh” who, inwardly and outwardly, lives only to do those things which are of use to the flesh and to temporal existence. A person is “spirit” who, inwardly and outwardly, lives only to do those things which are of use to the spirit and to the life to come. The very foundation of sin coming upon man was unbelief. Adam and Eve believed the deception rather than the Word of God. If they had only believed what God had said, they would have lived in eternal bliss. Jesus defined sin as unbelief. God defined sin as going your own way. It is unbelief that leads us to go our own way. Unbelief in Romans reaches far beyond simple belief in Jesus as your Savior. Essential for being born again, yes, but belief is essential for your very LIFE as a son of God. Your belief in the Word of God is foundational to your LIFE here and now and for all eternity. Paul uses Old Testament illustrations to convey the Truth of Romans. 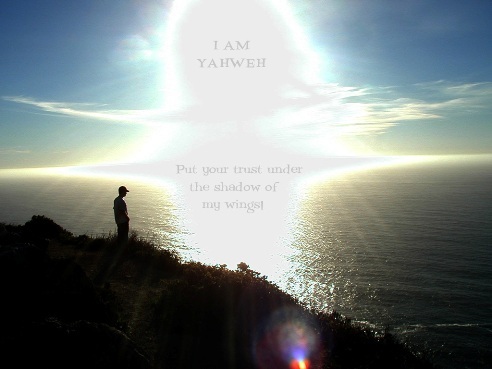 He points out Abraham, who did not stumble at the promises of God by unbelief. His belief is what made him righteous before God. His believing the promises of God is what gave him LIFE here on earth and in all eternity. In Romans, Paul lays out the truth of the gospel of Christ, and that truth doesn’t end at the cross, it goes through the cross to affect not only our sins, but our sin nature. We are made righteous by our belief in the promises of God. That belief does not stop at the cross. It does not stop at being born again. Belief in the Promises of God’s Word is to be a daily thing whereby we are made righteous every day. We are given LIFE every day. Not life in the flesh, but life in the Holy Spirit of God! 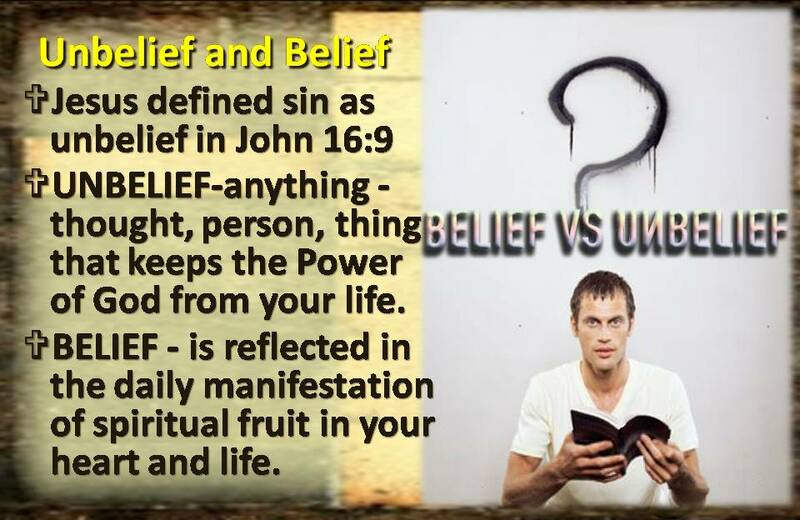 UNBELIEF-anything -thought, person, thing that keeps the Power of God from your life. BELIEF – is reflected in the daily manifestation of fruit in your heart and life. Romans is the richest possible teaching about what a Christian should know: the meaning of law, Gospel, sin, punishment, grace, faith, justice, Christ, God, good works, love, hope and the power of the cross. We learn how we are to act toward everyone, toward the saints and the sinners, toward the strong and the weak, friend and foe, and toward ourselves. Paul bases everything firmly on Scripture and proves his points with examples from his own experience and from the Prophets, so that nothing more could be desired. Therefore it seems that Paul, in writing this letter, wanted to compose a summary of the whole of Christian and evangelical teaching which would also be an introduction to the whole Old Testament. Whoever takes this letter to heart possesses the light and power of the Old Testament. Therefore each and every Christian should make this letter the habitual and constant object of his study. The introduction (1:1-17) delineates the theme of the book of Romans, which is the gospel of God. This is the content of the introduction. Our next tour will explore this Gospel which was so important to Paul. Following the introduction, we have the section on condemnation (1:18—3:20) that unveils to us the need of God’s salvation. We all are hopeless and helpless cases and are under God’s condemnation. We need God’s salvation. Justification brings us to God. In fact, it not only brings us to God, but also into God. Therefore, we may have the full enjoyment of God. The King James Version says, “We joy in God” (Rom. 5:11). We not only joy in God; we enjoy God. God is our enjoyment. This is justification. Following this, we have sanctification (5:12—8:13). How great it is to be in God and to enjoy God! After being justified, we need to be sanctified. What does it mean to be sanctified? We use the illustration of tea. If we put tea into a glass of plain water, the water will be “teaified.” At best, we are plain water, although we are actually not plain, but dirty. Even if we are plain water, we lack the tea flavor, the tea essence, and the tea color. We need the tea to come into our very being. Christ Himself is the heavenly tea. Christ is in us. Hallelujah! In chapter 6 God in IDENTIFICATION. In chapter 8 God in US. Christ is in us (Rom. 8:10)! He is no longer merely in creation, redemption, justification, reconciliation, and identification, but He is now within us, in our spirit. Christ is in us doing a transforming and sanctifying work, just as the tea, when put into the water, works the element of tea into it. Eventually, the water will be wholly “teaified.” It will have the appearance, the flavor, and the taste of real tea. If I serve you some of this beverage, I will be serving you tea, not plain water. If some of you married men claim to be sanctified, what would your wives say? “He may be justified, but it is doubtful he is sanctified.” Or you might say”maybe a little bit… or maybe he is improved, but I do not think he is sanctified yet.” I am not talking about being improved, but being sanctified—that is to have the very character of Christ worked into our very being, just as the essence, flavor, and color of the tea are worked into the water. This is sanctification. And every born again Christian should learn that he indeed is sanctified. The next section in the book of Romans is GLORIFICATION (Rom. 8:14-39), unveiling the purpose of God’s salvation. Following sanctification, there is the need of glorification. Our body needs to be glorified. Although a brother may be quite saintly, his body needs to be glorified because of its physical defects and limitations. When the Lord Jesus comes, we will be glorified. Presently, I must wear thick, peculiar eyeglasses, but when the Lord comes I will be glorified. We shall not only be justified and sanctified; we shall be glorified, that is, our body shall be redeemed. Glorification is the full redemption of our body. This glorification reveals the purpose of God’s salvation. The purpose of God’s salvation is to produce many brothers to Christ. Originally, Christ was the only begotten Son of God. Now the only begotten Son has become the firstborn Son. We ourselves will be processed into the many brothers of Christ and the many sons of God. He is the firstborn Son, and we, the many sons, are His many brothers. This is the purpose of God’s salvation. After glorification, we come to selection which reveals the economy of salvation (Rom. 9:1—11:36). God has a purpose and an economy. His economy is for the fulfillment of His purpose. God is very wise and He arranges everything for the fulfillment of His purpose. He knows what He is doing. He knows who are His chosen people and He knows when His chosen people should be called. In relation to God, selection is for the accomplishment of His purpose; in relation to us, selection is our destiny. After this, we have the section on transformation, unfolding the life-practice in salvation (Rom. 12:1—15:13). In this section we see the life-practice of all that has been produced by the life-process. Whatever is produced in the section on sanctification is practiced in the section on transformation. Eventually, sanctification becomes transformation. In one sense, we are in sanctification; in another sense, we are also in transformation. We are in the process of life and in the practice of life that we may have the Body life with a proper private life. Every aspect of the proper Christian life and church life is included in this section on transformation. While we are being sanctified, we are also being transformed from one form into another form and from one shape into another shape. Praise the Lord! We are all under the life-process of sanctification for the life-practice of transformation. The last section of the book of Romans is the conclusion, indicating the ultimate consummation of salvation (Rom. 15:14—16:27). The ultimate consummation of God’s salvation is the churches—not just the Body, but the local churches as the expressions of the Body. Hallelujah! The book of Romans begins with the Gospel of God and concludes with the local churches. In Romans, we do not have the local church in doctrine but the local churches in practice. The major structures of the book of Romans are three— salvation, life, and building. 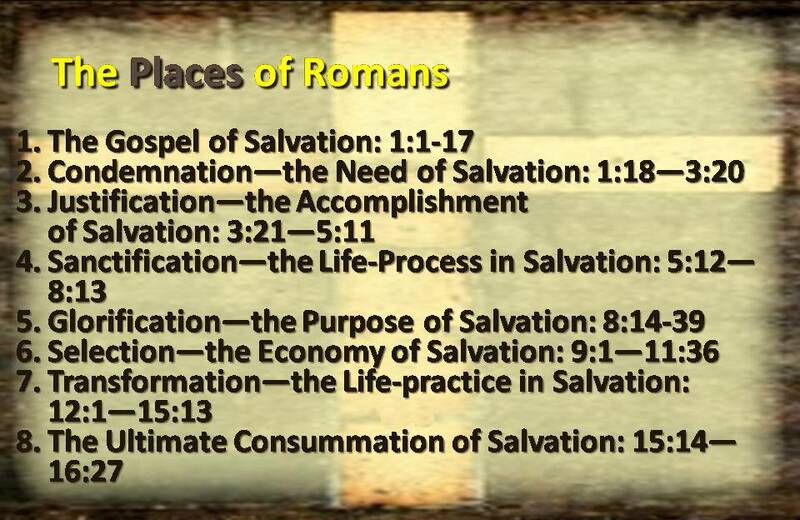 The first major structure of Romans is salvation, revealed in 1:1—5:11 and 9:1—11:36. Salvation includes propitiation, redemption, justification, reconciliation, selection, and predestination. In eternity past God predestinated us. Then He called us, redeemed us, justified us, and reconciled us to Himself. Thus, we have full salvation. We need to differentiate between redemption and salvation. Redemption is what Christ accomplished in the eyes of God. Salvation is what God has wrought upon us based upon the redemption of Christ. Redemption is objective, and salvation is subjective. When redemption becomes our experience, it becomes salvation. Salvation is for the life unfolded in 5:12—8:39. In this section the word life is used at least seven times and, according to chapter 8, this life is four-fold. 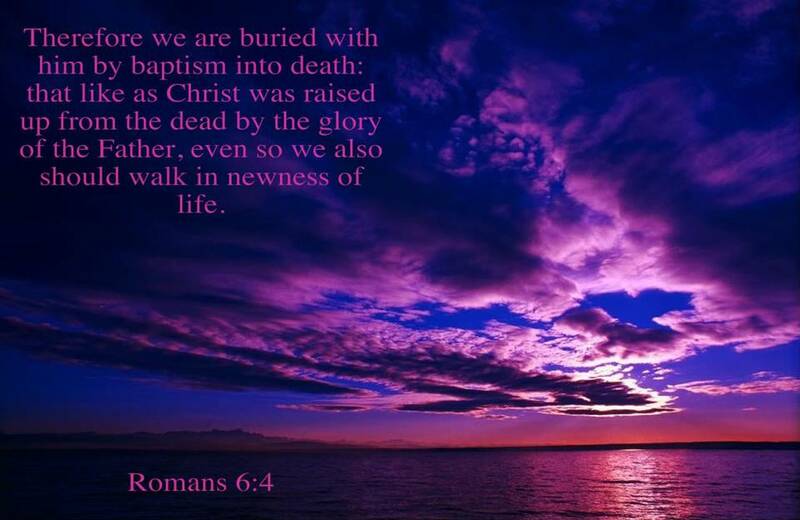 This Eternal Life or Life with God, begins not when we die but when we are born again! In the last part of Romans, 12:1—16:27, we have the building, the Body with all of its expressions in the local churches. Salvation is for life, and life is for building. 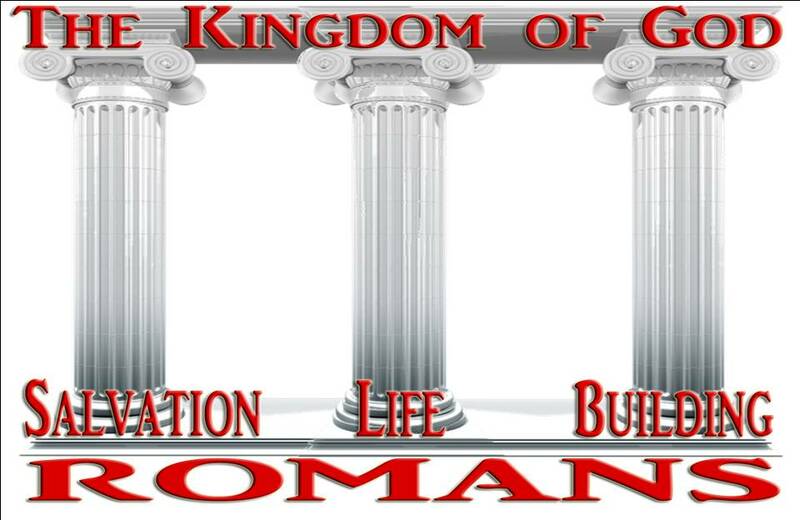 Thus, the three major structures of Romans are salvation, life, and building. 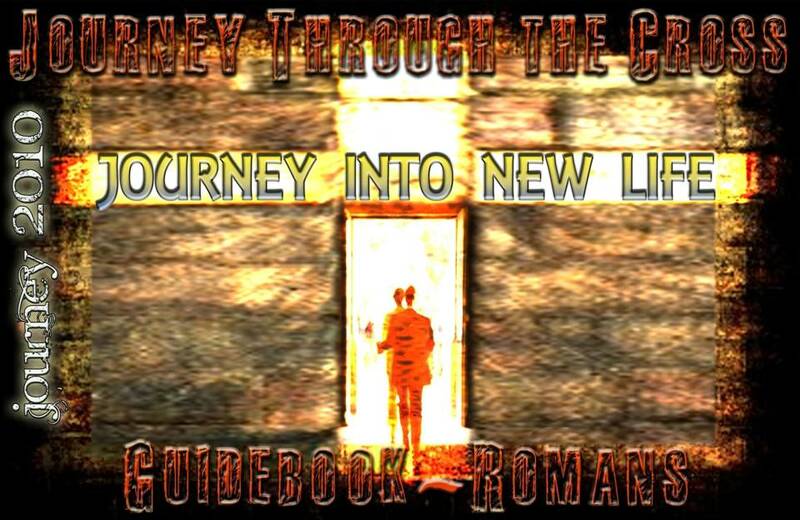 Why is our Tour through Romans called Journey Through the Cross? Paul is all about this New Life that is the result of the Power of the Gospel of Christ.